Inka Linda Sarvi grew up as a citizen of the world, having lived in Finland, Namibia, Zambia, the UK, the Philippines, Canada and now currently resides in London. She completed her undergraduate degree in Sociology at McGill University in Canada and she is currently completing her Master’s degree at the Goldsmiths University in Creative and Cultural Entrepreneurship. 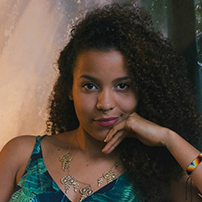 Along with Cleo Forstater, she is the co-founder of a burgeoning sisterhood called The Goddess League, which is aimed at cultivating a culture of self-love, healing, and personal expression for women of all ages and backgrounds within a supportive network. She is passionate about social media as a tool of self-empowerment and community building, as well as the importance of young people to reconnect with our creativity, emotional intelligence and individual life purposes in order to address societal problems as holistic beings. She is also very passionate about the power of narratives in shaping people’s realities and the need for young people to break intergenerational silence by expressing their highest truths. Lastly, she is also a spoken word poet and writer.